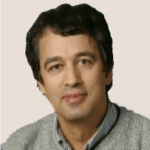 Moncef is a visiting researcher with over 30 years of experience in designing, testing, and assessing innovative energy efficiency and renewable energy technologies applied to buildings. He is a professor and a coordinator of the Building Systems Program, Civil, Environment and Architectural Department at the University of Colorado. With domestic energy demand in Saudi Arabia expected to potentially double by 2030, managing the relationship between energy consumption and economic growth will be very important for the Kingdom’s sustainable development. To assist in this task, this report recommends using energy productivity as an indicator and policy framework to help inform policymakers as to where and how the most value can be achieved from energy use. 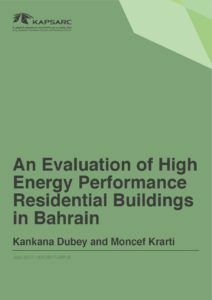 This paper describes our analysis of the cost-effectiveness of designing and retrofitting residential buildings in Bahrain and outlines our analytical approach. The study focuses on residential buildings since households consume more than 48 percent of electricity used in the country. As expected, residential buildings constitute the vast majority of Bahrain’s building stock, with about 76 percent of the total and projected annual growth in energy consumption of around 3 percent in the next few years. In the United Arab Emirates (UAE), buildings consume almost 90 percent of the total electricity used in the country, mostly in Dubai and Abu Dhabi. 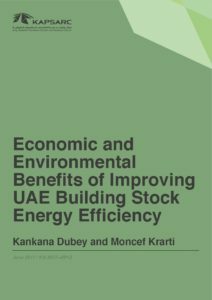 We undertook a study to explore available opportunities to improve the energy efficiency of the UAE building sector. This paper assesses the best combinations of energy efficiency measures that can be adopted at a minimal cost. In our simulation, we evaluated a series of energy efficiency options for both existing and new buildings. Our optimization analysis is based on the sequential search technique, applied to a wide range of applications, including combinations of energy efficient measures (EEMs) and retrofitting existing buildings. More than 75 percent of the total electricity consumed in Oman is attributed to buildings, with almost 50 percent used by households. The absence of mandatory energy efficiency regulations for buildings, coupled with population growth, has led to a significant increase in annual energy consumption and peak power demand in the country – both averaging growth rates of 10 percent over the last five years. We used an energy productivity analysis approach to analyze the benefits of large-scale energy efficiency programs in new and existing buildings. 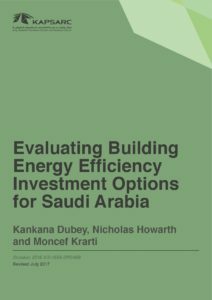 This study suggests that energy efficiency programs in buildings can provide up to a 27 percent reduction in electricity consumption and a 30 percent reduction in peak electricity demand for Saudi Arabia. 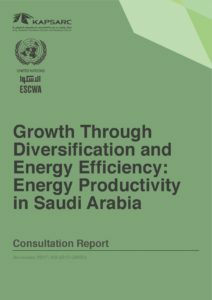 It is well recognized, however, that given the low electricity prices in Saudi Arabia there is little incentive for households and businesses to invest in energy efficiency. On the other hand, when system-wide benefits of energy efficiency investments are included their value is much higher, especially from the government’s perspective. These wider benefits include the reduced need for new electricity generation capacity investment, reduced carbon emissions and new employment opportunities. An unprecedented infrastructure investment boom occurred in the Gulf Cooperation Council (GCC) in the first part of the 21st century. Strong public capital spending supported by high energy prices provided governments with an opportunity to accelerate economic diversification and infrastructure investment, lifting economic growth and per capita incomes. The 2014 collapse in oil prices created an added impetus for a transition to a more sustainable growth model less dependent on volatile energy markets. Here we make the case for a greater focus on energy productive investment to drive this transition. 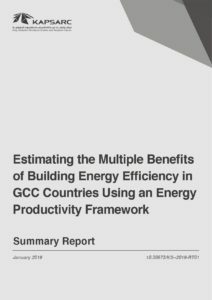 This report quantifies the direct and key indirect benefits of energy efficiency investment in buildings in Gulf Cooperation Council (GCC) countries. 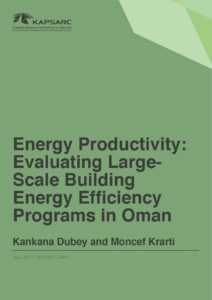 It summarizes the key insights from individual country studies conducted as part of KAPSARC’s energy productivity project. This analysis indicates that a strong case can be made for public energy efficiency programs that would encourage building owners to invest in the socially optimal amount of energy efficiency: Driven by population growth, rapid development and low domestic energy prices, energy consumption from buildings across the GCC has risen by over 200% on average since 2000 in both absolute and per capita terms, posing sustainability concerns. Even with the GCC’s relatively low electricity prices, the most basic energy efficiency investment options such as programmable thermostats, LED lighting and stopping air leakage have payback periods of less than five years for the consumer. Some energy efficiency retrofits, including more efficient air-conditioners and replacing windows and insulation, have longer paybacks periods. The investment case for increasingly ambitious energy efficiency actions becomes more compelling once the broader system benefits are included, such as reducing the need for new electricity generation capacity, avoided carbon emissions and creating new jobs and investment. 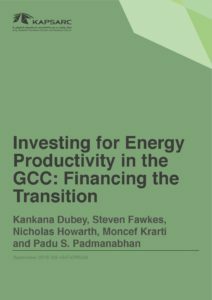 A deep energy efficiency retrofit has a payback period for investors of between 11 and 70 years, depending on electricity prices; by incorporating the wider system benefits, this payback period improves to between 7 and 23 years on average across the GCC. This analysis provides a strong case for public energy efficiency programs, without which building owners are unlikely to invest in the socially optimal amount of energy efficiency.